The Napa Valley Wine Train's evolution over the last 30 years brings to mind one of The Grateful Dead's most famous lines, from a song, ironically, named Truckin': "What a long, strange trip it's been." Once a pariah, now a paragon, the Napa Valley Wine Train—winner of the Napa Chamber of Commerce 2018 Large Business of the Year Award—has turned naysayers into fans, detractors into partners. It's amazing what new ownership and fresh perspectives can accomplish—say the locals—and in relatively short order, no less. 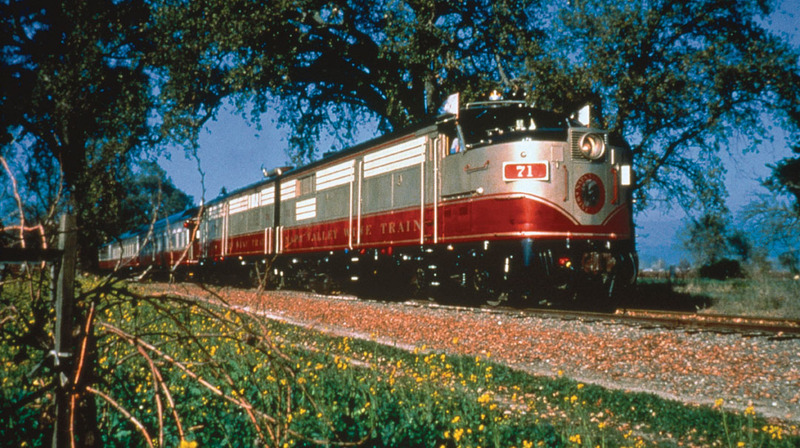 The Napa Valley Wine Train (NVWT) was formerly owned by the DeDomenico Family, former owners of Golden Grain Pasta, Rice-A-Roni and the Ghirardelli Chocolate Company. Three years ago, the NVWT was a tired business model. It mostly offered the same tour and the same food as it had for the past 27 years. The cars were the worn. The energy level was low. "The previous owners were very limited in marketing it," says Clay Gregory, chief executive officer, of Visit Napa Valley. "They just kind of started it and never made any meaningful changes." Looking toward retirement, but adamant about maintaining the legacy of the family, the DeDomenicos decided to unload the train, and in September 2015, sold it to Noble House Hotels & Resorts and Brooks Street, a real estate development firm with offices in Newport Beach and Napa. Since then, it's been a runaway train of creative ideas, new partnerships and a whole new bandwidth of community investment—not only in money, but also in personal involvement. In short, the new Napa Valley Wine Train comes with "skin in the game." To fully understand the NVWT transformation, it's necessary to take a look at its rocky history to gain perspective. In 1984, Southern Pacific Railroad, which owned the tracks, abandoned the old freight line and sold the property, which included 17 parcels of adjacent land. Concerned Napa Valley residents, who did not want to lose the rail line, banded together to create "The Society for the Preservation of the Napa County Railroad." They attempted to pass a measure to save the rails, but it failed at the ballot box. That encouraged another group of Napa citizens to create the Napa Valley Wine Train Inc. In time, they found an investor in Vincent DeDomenico, who bought most of the shares of the company and became its president and chief executive officer in 1987. Over the next two years, NVWT worked to restore the long-abandoned train tracks. "The tracks hadn't been used for decades," Gregory explains. "They needed to be retrofitted. And the way California law was set up, people with a railroad easement (the winery and vineyard owners, for example) were responsible for taking care of the tracks." Gregory was working for Robert Mondavi Winery at the time the NVWT was created. The train tracks crossed Mondavi's property, he says, and the Mondavis were theoretically supposed to take care of the tracks, but it made no sense to do so when there were no trains running at the time. When the NVWT presented the law to land owners with easements and said they had to update the tracks, says Gregory, that's when people got angry. when the train needed to cross already congested Highway 29. They feared it would turn Napa Valley into another Disneyland. They persuaded the California Public Utilities Commission (PUC) to require the train to comply with the California Environmental Quality Act (later rejected by the Supreme Court of California). They put up "No Wine Train" signs all over the valley. And when the train finally started rolling down the track in September 1989, the locals occasionally protested the dining cars as they passed. In fact, only one winery owner—Mike Grgich of Grgich Hills—supported the train. (See sidebar "Grgich Hills".) For years, Grgich Hills was the only winery at which the train stopped. Over time, tensions eased. But the original owners never got over the fact that there were so many people unhappy about it in the beginning, says Gregory, so they didn't reach out (to the locals) in a way that would help to sell the experience. And then there was the 2015 "Sisters on the Reading Edge" book club incident. A group of 11 women—10 African-American and one Anglo—booked a trip on the NVWT. They were asked by a train attendant to leave for "laughing too loudly." The women, ranging in age from 39 to 85, alleged racial bias and white privilege, suing the NVWT for $11 million. The lawsuit made national news. Just three weeks after the incident, the NVWT was sold to its current owners. The lawsuit was promptly settled. And a new conductor came on board. Scott Goldie is a principal of Brooks Street and has been the most recognizable "face" of the new NVWT, serving as its managing director until just recently. A Montana native, Goldie grew up in Port Angeles, Wash., leaving immediately after high school. He earned an undergraduate degree in international finance at George Washington University in Washington, D.C., then spent a few years working as chief financial officer of Crescent Bay Company, a real estate development firm in Santa Monica. When a short recession hit in the early 90s, Goldie went back to school at the Kellogg School of Management at Northwestern University in Chicago, where he earned his master of business administration. Although he once declared he would never get back into real estate, he did. And a series of fortuitous events led him to co-found Brooks Street. When Brooks Street was approached to buy into the NVWT, Goldie didn't think it was such a good idea—until he saw the 17 parcels of land that were part of the package that weren't needed for the train. Those could be sold and the money could be used to reinvest in the Wine Train and fund the partnership's real estate projects. So far, three properties have gone on the block: a parcel next to a gas station in Napa was sold to the gas station; land across the street from the Oakville Grocery was sold to the Napa Valley Grapegrowers; and an office building in St. Helena was sold to the Daniel Capp revocable trust. A few minutes with Goldie and you can tell his mind never stops. "Scott is full of ideas. Literally, every time I see him, he's got a new idea," says Violet Grgich, president and chief executive officer of Grgich Hills Winery. A man with many irons in the fire, Goldie is relatively soft-spoken and possesses a calm, even demeanor, which has made him the perfect guy to smooth ruffled feathers and forge new partnerships when it comes to the NVWT. "I'm all about partnerships," Goldie explains. "I'm all about being part of the community. It's real easy for me to walk in and say, ‘Hey, I'm different. I want to partner. I want to be involved.' So we were embraced when we came in. The only negative I received at first was with two or three wineries who told me ‘Your train is not good enough for my wine.' So, I said, ‘Well, I'm going to change your mind.'" Goldie revamped the food. Instead of a static menu, he set up seasonal menus, sourcing from local purveyors. Today, each tour, with new winery partnerships, has different menus. He went to the wineries with his new ideas. He started with 400 train trips a year in 2015 – with four winery partners—and this year will surpass 1,300 tours with more than 20 winery partners. Two partnerships in particular were rewarding—Domain Chandon and Charles Krug. "Everyone on my team told me I would never get Domain Chandon," says Goldie. "So I got them to come ride the car and they said they would give me a three-month commitment. Now they are one of our best tours." The old train never went to Charles Krug Winery, says Goldie, even though our tracks go right through the middle of the property. The rift between Peter Mondavi Sr. and Vincent DeDominico wasn't even in the closet. Among the first people he met with were Marc Mondavi, Peter's son, and Marc's wife, Janice. "Peter Sr. had just passed away," says Goldie. "I said, ‘Hey, look, there's no reason we can't be great partners. I'm new and you're running things now.' Marc was pretty laid back," he adds, "but Janice just cut to the chase. She asked if there was anyone in our management group named DeDominico. I told her ‘no.' So they said ‘Okay, we can do business.' Now they're one of our best partners. We go there twice a day." Wine tours are still the NVWT's bread and butter, but the group is now offering special event trains, like the Tequila Train on Cinco de Mayo (which will repeat November 1 for Dia de las Muertes), a jazz train, a beer train (hop on board!) and the holiday Santa Train, which last year transported 13,000 people. The wine trains attract many tourists, but the other special event trains attract more locals. Goldie also receives income from companies that charter trains and use them for conferences, weddings and other special events. While the NVWT is its signature project, the partnership is also promoting major real estate enhancements that will forever change the face of Napa and, to a lesser extent, the valley. It has announced plans to build a new train station-hotel on its current site. It will have a 65-foot atrium and 148 rooms. This means Napa will have one of only four hotel train stations in the United States (others are in Denver, Indianapolis and Nashville). The partnership wants to restore the old Rutherford Train Station, which is 147 years old and a county eyesore. It has attracted the homeless, and Goldie fears it may catch on fire. There's also talk of workforce housing in Napa. And using the train to transport workers up valley, relieving traffic on Highway 29 and cutting into pollution. But the change that lights up Goldie's eyes is the Rail Arts District—two miles of art along the tracks, which it shares with the Vine Trail bike path and a pedestrian corridor. Artists from all over the world, including locals, are being commissioned to design large murals – painted on cinderblock walls that line the tracks. Seven have been completed, 60 are planned. One that is utterly amazing is "Daisy Chain" by artist Bryan Valenzuela inside the train station. It depicts two hands entwined. Closer inspection shows that the arms and hands are "painted" with the use of words describing the October Wine Country Fires (Goldie lost his home on Atlas Peak) and how everyone helped each other. In all, Goldie has planned for 120 art installations, including the murals, sculptures, pocket parks and vertical gardens. "My vision for the whole area is that it will be an urban district. More galleries will pop up. More art, more foot traffic—and the whole area becomes safer. Less graffiti, too," he says. "I see the art district attracting millions of visitors, becoming one of the most important art districts in the world." Goldie has found great assistance from Peter Pirnejad, Ph.D., Napa's new assistant city manager, who, in some cases, has managed to get projects approved in less than two weeks. "Through the aid of city colleagues, I'm trying to help both the council and wine train achieve their vision," Pirnejad says, noting that Napa has many different projects where Goldie's innovative approach to problem-solving can be of great help. Pirnejad is looking to bring crowdfunding to the wine train to help finance their district goals of installing more art in the art district. "Although this doesn't preclude them from complying with city rules," says Pirnejad, "the hope is that it helps them achieve their goals." "From my perspective, this is a win-win for the community and the property owners," he adds. "The community benefits from the beautiful corridor, while the property owners get a fresh facelift on their ‘back of house.'" "My goal for the wine train is to make it culturally relevant," asserts Goldie. "I love art, we're into music now with a concert series called Rock the Rail. We're obviously into food and wine. And we're into history with our restored cars." But what's the greatest thing of all? Goldie laughs. "I'm a big kid with a train." The Napa Valley Wine Train traces its history to the Napa Valley Railroad, which was built by Samuel Brannan, founder of Calistoga. His goal was to bring tourists from the Bay Area to his resort town, where they enjoyed the mineral water spas and pastoral views. Here are key dates in the evolution of the train. 1864 - Samuel Brannon opens 42 miles of train track between Calistoga and Vallejo, where it's connected with San Francisco Bay ferry boat service, to transport visitors to and from Calistoga. 1869 - After Brannon's expensive divorce, California Pacific Railroad Extension Company purchases the Napa Valley Railroad Company in a foreclosure sale and renames it California Pacific Railroad. 1885 - The track is leased to Southern Pacific Railroad and is connected to its main line in Suisun. Thirteen years later, Southern Pacific purchases California Pacific Railroad. Over the years, the railroad plays a vital role in the economic and agricultural development of the Napa Valley. 1904 - Southern Pacific extends the train line to Benicia. 1905 - An electric, interurban railroad—San Francisco, Napa and Calistoga Railway—is built parallel to the Napa Valley Railroad. The NVRR is relegated to freight service only. 1929 - With the advent of automobiles, the train begins to lose importance. Train service to passengers is halted. 1960 - Southern Pacific abandons the right of way between St. Helena and Calistoga. Eventually, it limits service to only one freight train a week on the remaining tracks. 1984 - Southern Pacific decides to abandon the entire line and sell the property. Retired Southern Pacific Engineer Lou Schuyler forms a group called "The Society for the Preservation of the Napa County Railroad" and puts a rail-saving measure on the Napa County ballot. It fails, but concerned Napa citizens, organized by Dr. Alvin Lee Block, form the Napa Valley Wine Train, Inc. The goal is to create a railroad that will preserve the transportation corridor for future use and reduce traffic congestion in the Napa Valley. 1987 - The Napa Valley Wine Train hunts for investors. Their search leads to San Franciscan Vincent DeDomenico of Rice-A-Roni and Ghirardelli Chocolate fame. DeDomenico buys most of the shares of the Wine Train and is appointed its president and CEO. The company sets out to acquire and renovate antique rail cars and spends $20 million to rehabilitate the tracks. 1989 - Surviving public outcry and attempts to stop its operation, the inaugural run of the Napa Valley Wine Train goes down the tracks on September 16. 1998 - The Society of International Railway Travelers and the editors of The International Railway Traveler name the Napa Valley Wine Train as one of the 20 Best Railway Experiences in the World. 2007 - Vincent De Domenico dies in October. Family members choose son-in-law Gregory McManus to be CEO. 2009 - St. Helena's City Council, long a foe of the Napa Valley Wine Train, votes to allow passengers to disembark in St. Helena—but on a trial basis and only on the first Friday of the month (May-October). 2015 - The Napa Valley Wine Train makes national news when it's sued by a book club group after 11 members were removed from the train for laughing too loudly. 2015 - Three weeks after the book club incident, the Napa Valley Wine Train is sold to Noble House Hotels & Resorts and Brooks Street. 2016 - The book club lawsuit is settled in April for an undisclosed sum. New ownership expands tour offerings and develops new partnerships with multiple wineries in Napa Valley. 2017 - Noble House Hotels & Resorts announces plans to build a five-story, 148-room hotel on the railroad's property on McKinstry Street in Napa. More new tours are added. 2018 - Napa Valley Wine Train wins "Large Business of the Year" Award from the Napa Chamber of Commerce. Violet Grgich was in college studying music at Indiana University in the late 1990s when controversy over the Napa Valley Wine Train was at fever pitch. Now she's the president and chief executive officer of the winery her father, Miljenko "Mike" Grgich founded with Hills Bros. Coffee owners, Austin Hills and Mary Lee Strebl in 1977. 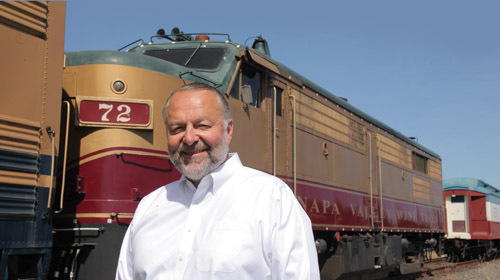 For the record, Mike Grgich was the only winery owner in the Napa Valley who publically supported the Napa Valley Wine Train, something current and past owners of the train have never forgotten. And Grgich Hills is still a primary stop on NVWT tours today. "It's been a long relationship," says Grgich. "My father has always been very practical, with a good business sense. He has always been pro-business and pro-community and wants people to achieve and be successful." Grgich has heard the stories about wineries getting assessments from the original NVWT owners but notes that her father "would never have agreed to pay to cross the tracks on his property." "Dad grew up with trains," she explains. and trains had always been a method of transportation in his life. In his eyes, he saw the train as picking up all these people and leaving their cars. They could enjoy beautiful Napa Valley. Why would someone have a problem with that?" She says her father saw the train as a way to ease traffic and pollution as well as a benefit to his business by bringing him customers. Grgich grew up in St. Helena and never understood the town's opposition to the train. "Were I a business owner, I would think: here comes the train! All these people are going to be here for several hours. They want to eat, they want to shop, they don't have cars that need to be parked somewhere, they leave their money and then they leave town. That sounds like a wonderful way to do business." And that's precisely why Grgich Hills "has always been excited to have the Wine Train stop here. It brings more people," Grgich says. "Everyone is different and has a different business philosophy, but ours is pretty simple. It is hard to have a business when you don't have people." Grgich does note a change in heart among the wineries about the NVWT. And she points to The Great Recession as part of the reason why. "With the recession, there was a realization that the Wine Train could help them," she says. And all the gloom and doom that was predicted at the outset before the train became a reality? "It's definitely not a Disneyland experience," Grgich says. "It's a high-end dining experience in a moving vehicle in which you get to see the amazing beauty of Napa Valley. Napa Valley is gorgeous and it's wonderful to see it in slow motion without worrying about driving."